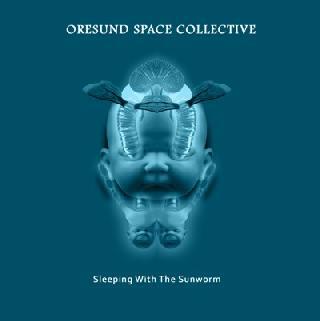 Oresund Space Collective - "Dead Man in Space" / "Live At Roadburn 2010" / "Sleeping With The Sunworm"
2011 marks the release of three new albums from Scandanavia's Oresund Space Collective, an outfit that specialises in completely improvised spacerock music. Made up of players from Denmark and Sweden, but with a rather loose membership, the band formed in April 2004, and has released a steady stream of studio albums and live CD-Rs since that time. In fact, differentiating between OSC's live and studio work seems almost artificial, since every gig and studio session features free-form jamming, as opposed to (for example) live shows and albums being merely in-concert versions of previously-released studio material. Of these three albums, two are studio recordings from the same massive October 2008 session that also brought us "Slip Into The Vortex", while the other is a live show from last year's appearance at the Roadburn Festival in Holland. First issued as a limited-edition (300 copies) vinyl release in 2010, "Dead Man In Space" is now available on CD in an extended form, and with different cover art (although the rather chilling artwork from the original LP is included in the CD booklet). "High Pilots" is the opening track on the album (although actually the last jam from the 2008 session which produced such a wealth of material), and is eleven minutes longer than the twenty minute side on the original vinyl edit. It would be fair to say that, this far down the line, you know what you are going to get when you put on an OSC album, but the results are none less enjoyable for all that, consisting of tripped-out interstellar excursions, crystal-clear guitars, with occasional echo and wah-wah laid on, and swirling, pulsating synths. Track two is the slower-moving "Who Tripped On The C(h)ord?" (left off the vinyl edition due to time constraints) that drifts sedately through the cosmos for ten minutes. "Space Jazz Jam 2.2" features guest member Anders weaving his sax through the mix of guitars and synths, over a rhythm that is about as close to danceable as OSC are ever going to get. The final track, which also gives the album its title, is a spoken word piece (an OSC first) improvised by Dr Space, which calls to mind "Space Station Announcement" from Nik Turner's "Prophets Of Time" album. 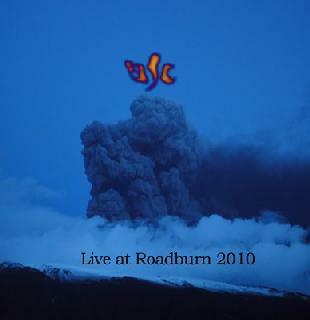 OSC's ninth album "Live At Roadburn 2010" is a vinyl-only live offering, with five tracks spread across four sides. The Collective opened the 2010 Roadburn Festival, and had apparently packed out the venue twenty minutes into their set, about the amount of time it took them to play their first number, suitably entitled "Roadburn Jam". As far as I am aware, none of this music has appeared on any of their previous studio albums, the audience being treated to a series of compositions by the six musicnauts currently making up the core band. In fact, the first sign that this is even a live recording doesn't appear until the twelve minute mark, when one of the band members offers up some festival-introducing chat. 15 minutes in, and the jam reaches thrilling intensity with an extended wah-wah guitar solo running through the music. After some band introductions by Dr Space, side two begins quietly with "Reintroduce The Snakes To Ireland", which seagues into "Volcanoes And Ash", named for the Eyjafjallajokull Icelandic volcano that exploded on 14th April 2010, the day before the festival opened, wreaking havoc on travel plans which caused some bands to miss their festival gigs, while OSC themselves were stranded in Holland for a couple of extra days. At twelve minutes in length, "Reintroduce the Snakes" proceeds from sparse emptiness to high octane riffage, while "Volcanoes" is more synth-focussed for much of its length. Mercifully, and despite featuring in a festival that focusses strongly on the many sub-genres of metal, OSC never lose their funkiness and lightness of touch, and "Global Freakout In Tilburg" features intricate guitar picking, and an almost country feel to it, at least in the first half of its 16 minute length, whereupon it metamophoises into a dub improvisation. At its conclusion, the band promises to play some heavy stuff, although the resultant jam fades out after only a minute or so, at the close of the third vinyl side. Side four features a 15 minute "Farvel" with some Gong-style glissando guitar which builds up to a frantic finale. There are currently no plans to release this set on CD, and the time restrictions of the vinyl format means that one number, "Jam For Tobias" (their sound mixer) was unable to be included. Should a CD release follow (as is very much hoped will be the case), the missing track will be restored to its rightful place. "Sleeping With The Sunworm" is OSC's 10th official release, a limited edition of 500 copies worldwide, recorded at the same sessions that brought us "Slip into the Vortex" and "Dead Man in Space". 56 minutes in length, the album comprises one long spacerock jam, divided up into three segments of unequal length solely for ease of play. Part one opens with one of bassist Jocke's hypnotic loops, overlaid with guitars that simultaneously drone and slice through the mix, and plenty of those patented hissing, whooshing synth noises. In a rare move for OSC, small sections of this lengthy track were overdubbed, due to equipment problems, but the "live in the studio" sound is as convincing as ever. OSC works best as a groove machine, eschewing chord progressions and melodic structures in favour of ever-changing bass and drum patterns, which rise and fall with tidal frequency, and telepathic co-ordination between the musicians. Part two (into which part one seamlessly flows), features soaring "classic-rock" guitar soloing, while the mid-section of part three breaks down into a very sparse echoing passage, before the rhythm section locks back into another uptempo groove, that all ends rather suddenly; even at just under an hour you can't help but wish they would just keep playing for a while longer. Throughout, the musicians are so note-perfect that it is hard to believe these are really improvised pieces. 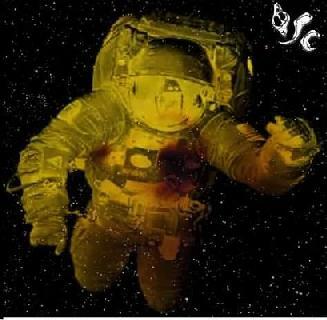 Ten albums on, and without the limitations of separated track time, "Sleeping With The Sunworm" is OSC's most cohesive offering yet, and a great entry point into their rapidly growing back catalogue.